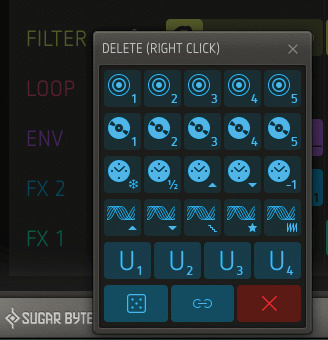 If you are a fan of weird, wonderful, glitchy and generally ‘out–there’ audio effects that can spice up even the most mundane of sound sources, you may well already be familiar with the Sugar Bytes brand. SOS have already reviewed a number of their tools for doing just that, most obviously Effectrix (March 2009) and Turnado (December 2013). The latest release, and the subject of this review, is Looperator, which takes some ideas from Effectrix and marries them up with elements of the loop and beat–slicing found in another Sugar Bytes plug–in, Egoist. 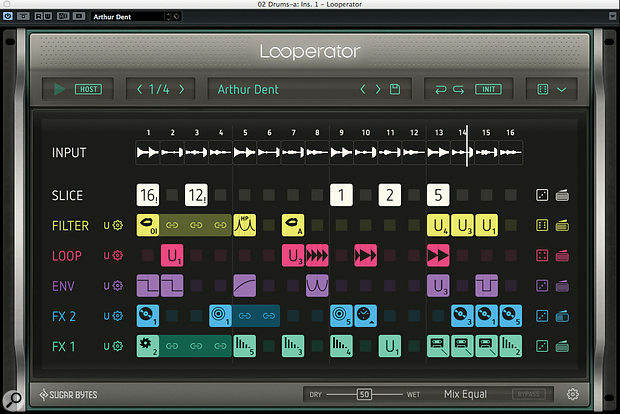 In essence, Looperator takes incoming audio, chops it into steps and runs it through an effects processor controlled by a 16–step sequencer. 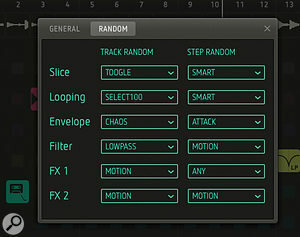 Each step can be treated to a different set of effects from an armoury that includes filters, stutters, slices, distortion, tape stops, volume modulation and looping, all similar in nature to the effects found in both Effectrix and Turnado. The effects can be programmed into a multi–lane, step–based editor and, as in Effectrix, can be synchronised to your host DAW during playback. The step length used to loop the overall 16–step sequence can be half, quarter or one–eighth of a bar, meaning that the 16–step pattern runs for eight, four or two bars respectively. 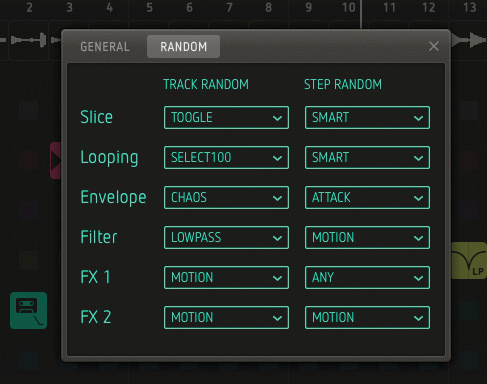 There are six lanes within the sequencer called Slice, Loop, Env, Filter, FX1 and FX2, and each is provided with 20 different preset effects types. Each lane offers 20 preset and four user–definable effects types, as shown here for the FX2 lane. The effects to be found in the first four of these are pretty much what you would expect, while the FX1 lane covers delay, tape stop, distortion and ‘tonal delay’ while FX2 spans reverb, vinyl, stretch and phaser effects. Each of the six lanes also allows you to build four of your own ‘user’ effects (U1–U4). Different control sets are provided in each lane, with some impressive options for designing your own effect outcomes. For each step, the processing chain runs from the top lane to the bottom, and unlike in Effectrix, you can alter the order of the six lanes using a simple drag–and–drop process. You can also adjust the wet/dry balance on a per–lane basis. Looperator can operate as a stand–alone application, applying its effects to an audio file loaded into the built–in audio player/recorder. 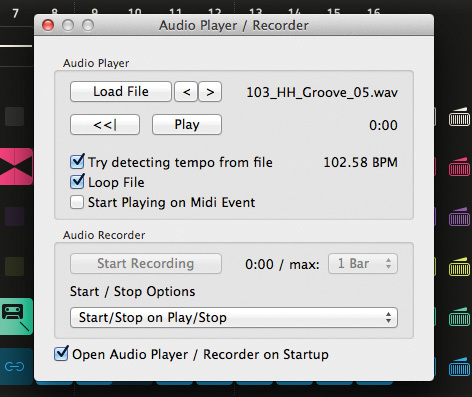 Used as a stand–alone application, Looperator allows you to process pre–recorded audio files. However, I suspect most users will use the plug–in version inserted on an audio track within their favourite host program. 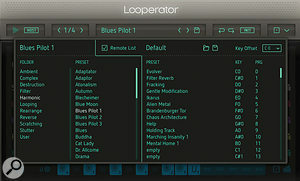 In this configuration, Looperator can be set to trigger either automatically in sync with the DAW’s transport controls, or via MIDI notes from a separate MIDI track. Depending on which you choose, Looperator then cycles through its 16–step effects pattern until either the host is stopped or it receives a MIDI Note Off message. 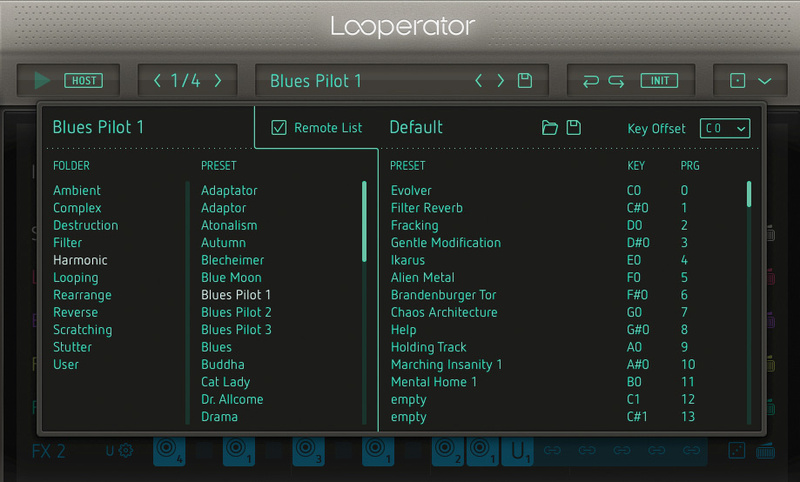 Looperator presets, which are basically combinations of effects settings within the multi–lane sequencer, can also be assigned to MIDI notes, The Remote List allows you to link Looperator presets to MIDI notes for remote selection and triggering. allowing you to trigger preset changes in real time. This combination of triggering options gives you plenty of flexibility when it comes to applying Looperator’s processing magic to your audio signals. On the practical front, all the usual plug–in formats are available, in both 32– and 64–bit versions. Once purchased, the software is available as a modest download from the Sugar Bytes web site, and authorisation is serial-number based. I did most of my own testing using the VST plug–in within Cubase 8. I had no problems with installation/authorisation and was up and running within minutes. Looperator is supplied with a huge collection of preset effects sequences to explore, but creating your own is easy: simply click on a cell and pick any effect from the dialogue that appears. If you want an effect to last more than a single step, Shift–drag will link as many steps as you require. Right–click will clear an effect from a step. As with all Sugar Bytes software, there are some comprehensive randomising options. These can operate at the global level, or at the level of each lane, using the various dice icons. Via the Settings dialogue, you can also configure just how wild these randomise options can get. This is all very clever and, if you do just like to roll the dice to see what happens, you have enough control to keep things within sensible bounds. The Random options in Looperator are particularly clever and can be configured as the global level or, as shown here, at the lane (track) or step level. The presets are all very usable, and if you can’t find one that delivers what you need, the user–definable effects for each lane give you plenty of further options. This is particularly true for the delay treatment where you get much greater control if you roll your own. I liked the tape-stop effects, even if they can be a bit of a cliché, and the various filter effects are both a lot of fun (particularly the vowel options) and easy to use. If you want to dig deeper, the four user–definable effects available within each lane provide plenty of options, as shown here for the FX1 lane. The Slice lane is perhaps worth a further comment. We normally associate beat slicing with pre–recorded loops; for example, you might take a drum loop, chop it into beat–sized slices, and then experiment with the slice playback order. As shown in the screenshots, Looperator displays the waveform of the incoming audio in the Input lane, and the Slice track allows you to specify which of the 16 slices will play back for any step in the sequencer. When used as a plug–in, however, Looperator is slicing audio ‘live’ as it arrives from the audio track upon which it is inserted. While it can easily play slice 1 at, for example, step 8, it’s less clear how it might play slice 16 at step 1. 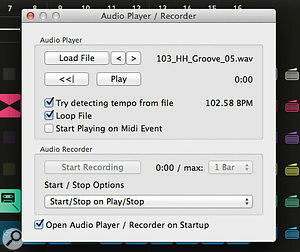 The solution is simple: the audio played in step 1 is taken from the audio that formed step 16 on the previous cycle. As a little visual reminder that this is going to happen, a small exclamation mark appears on the step label if you configure a slice effect for a step that is based on a slice that doesn’t occur until later in the sequence. Despite its friendly and apparently simple interface, Looperator hides a huge number of possibilities. You can just plug in and freak out with the many excellent presets, but if you really want to get the best from the software, expect to spend a little time exploring how the various tools interact. The PDF manual is helpful here, but this is a surprisingly deep plug–in if you really dig in. I had no technical issues while experimenting with Looperator, and once the initial orientation process is dealt with, it is actually pretty easy to use. Like Effectrix and Turnado, Looperator can do subtle (that’s up to you as the user), but where it really excels is in the obvious, in–your–face audio effects that can add interest to any electronic music production. In that context, a little can go a long way, but if you want to use Looperator on multiple tracks, it didn’t seem overly demanding on CPU resources when I ran a number of instances within a full Cubase project. Sonically, the results are exactly what you might expect given Sugar Bytes’ pedigree in this type of audio processing. 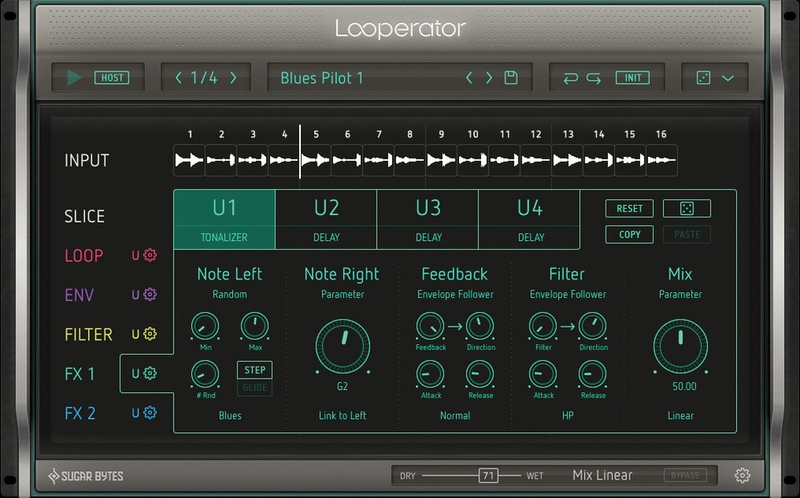 Whether you want simple filter effects, tempo–sync’ed delays, DJ–style tape stops, stutter effects, slice–based beat manipulation or (this is a multi–effects processor, after all), all of these things together, Looperator can deliver. And even if you start with the most mundane of drum loops or synth pads, Looperator can turn it into a featured mix element in any number of possible ways. Perhaps the only other comment worth making is that the suite of effects does cover the same ground as Effectrix and Turnado. If you already own those two plug–ins, you might argue that, sonically, there is nothing radically new here. 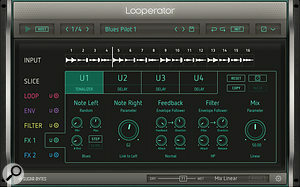 However, the effects are accessed and applied in a different fashion in Looperator, and with its combination of ‘live slicing’, user–defined effects and ease of use, it is perhaps the most easily learned way into this kind of creative multi–effects processing that Sugar Bytes currently offer. For those new to this kind of creative audio effects processing, Looperator manages to put these audio tools into an accessible yet powerful package and would provide a great starting point. Perhaps the most obvious competitors for Looperator are Sugar Bytes’ own Effectrix and Turnado, but rivals such as iZotope’s BreakTweaker offer similar glitchy production tricks. Very accessible creative multi–effects tool for electronic music production. Plenty of depth once you dig in. Might not offer enough that’s new or different to tempt users of other Sugar Bytes plug–ins, such as Effectrix and Turnado. If you are looking for a creative multi-effects processor for DJ- or electronica–style effects, Looperator from Sugar Bytes manages to combine ease of use with surprising depth. Apple iMac with 3.5GHz Intel Core i7 CPU, 32GB RAM and Focusrite Scarlett 8i6 interface, running Mac OS 10.9.5. Tested with Steinberg Cubase 8.0.5.